Posted Jan 15, 2019 by Eds. Rosa Luxemburg is, without a doubt, one of the most important revolutionaries to emerge from that tumultuous period that ran from the end of the 19th century through to the aftermath of the First World War. This was a time of immense social, political, technological and economic change. 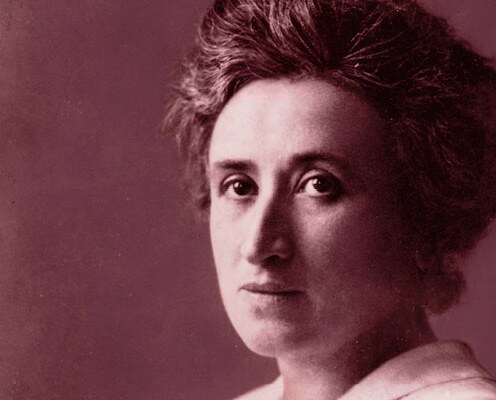 It was also the time when socialist revolution became real—and Luxemburg contributed to theorising and partaking in those revolutions, right up until her murder at the hands of the counter-revolutionaries in Berlin on 15 January 1919. This generation of revolutionaries—Lenin and Trotsky in Russia, Gramsci in Italy, James Connolly in Ireland and Luxemburg in Germany—learned more in a few years than most of us have in a lifetime. They were centrally involved in struggles that cracked open the edifice of capitalism in its most brutal and naked form, in war. They witnessed workers forming new democratic bodies which gave an indication of how society could be run completely differently; they also were the first to begin to understand the limitations of reformist socialism, which tried to replace revolution with a long, slow and peaceful road of reform. Luxemburg in particular waged war on this top-down, bureaucratic set of ideas, looking instead to how workers in struggle—both political and economic—could suddenly transform the situation, and begin to develop the real means of self-emancipation. So, although Luxemburg died a century ago, her ideas are not simply for the past. The world has changed immensely since 1919, but Luxemburg’s understanding of how revolutionary aims make us better at fighting for reforms in the here and now; her descriptions of the dynamic interactions of political and economic struggles; and her absolute commitment to the potential power of working class people and the oppressed to fight for a better world are all equally relevant today. She strikes a remarkable figure. A Polish Jew born in 1871 in the racist Tsarist Russian Empire, she was already a revolutionary at the age of 15, having grown up witnessing the state’s repression of radicals. She chose to throw herself into a life she knew was dangerous and difficult. This is a recurring theme in descriptions of Rosa Luxemburg by people who encountered her. The same sense comes through in Luxemburg’s own writings, and in her letters, a huge collection of which were published by Verso in 2011. She was someone who had absolute confidence to speak out, fight for her ideas and never simply accept what she was told just because the person telling her was older or more experienced. She questioned everything and re-examined everything in order to come to her own conclusions. She also had a powerful ability to connect with people and to maintain an optimism of the will even in the most difficult circumstances. These qualities did not endear her to everyone, of course. When she moved to Germany, the heart of the socialist movement, in 1898 to join the Social Democratic Party (SPD) she quickly antagonised the leaders of the organisation by publishing Reform or Revolution, a critique of leading SPD member Eduard Bernstein’s Evolutionary Socialism. Over the next few years she would continue to argue at conference after conference and in article after article that the road of reform does not lead to the same place as the road of revolution—rather it leaves capitalism intact, relying on a state machine which is formed and suited only to maintaining the power of the ruling class. One leading SPD member described her as “like a visitor who comes to you and spits on your carpet”. And she continued to “spit on the carpet”, waging battles within the SPD to try to get the organisation to respond to the changing workers’ movement, particularly after she witnessed the wave of revolutionary mass strikes that swept across the Russian Empire in 1905. The Mass Strike, her pamphlet about the Russian experience, is one of her finest contributions to revolutionary theory. It became strikingly relevant once again during the Arab Spring of 2010-11, when the political movements for democratic rights fed into and fused with workplace struggles about years of grievances, culminating in the overthrow of 30-year dictator Hosni Mubarak in January 2011. There has been a revival of interest in Luxemburg over the past decade, partly because Marxism seems to fit when the global economy is in crisis, and partly because of her interest in “spontaneous” struggles from below and the way that she is popularly characterised as anti-party, or anti-Lenin. For some in the various Occupy movements of the first half of this decade, she is an acceptable revolutionary—untainted by association with the Soviet Union and known to have argued with Lenin about centralism and democracy. This is a common portrayal of Luxemburg. Typically, in an article in the New Statesman last November George Eaton wrote, “Though a foe of reformist socialism, Luxemburg’s most notable dispute was with Lenin.” This would seem to invert her life’s work — the majority of which was spent railing against reformism, while her article critiquing the Bolsheviks’ degree of centralisation of the Russian Revolution in 1918 was an engagement in a tactical debate about a revolution she supported and celebrated 100 percent. The Russian Revolution of 1917 held huge importance for Luxemburg—as for all revolutionaries—not least because it showed the way for German soldiers, sailors and workers, who followed suit in November 1918. But the German Revolution was not to succeed to the same degree as in Russia. Within days of the November revolt the Kaiser had abdicated, and a republic had been declared in Germany with SPD leader Friedrich Ebert as chancellor. This was a clever move on the part of the German ruling class, who understood that the only hope of avoiding full-on socialist revolution was by getting the workers’ party to head the new government. Ebert could tell the workers to go back to work and leave it to him to fix Germany. Luxemburg’s fatal mistake was to underestimate the hold of reformist ideas over workers, even in the midst of a revolution. Although some workers did look to the revolutionary leadership of Luxemburg, Karl Liebknecht and others in the newly-formed Communist Party (KPD), many more maintained their allegiance to the “traditional” party of the movement, the SPD. The shallow roots of the KPD affected its ability to act effectively. This weakness led to the disastrous Spartacist Rising of January 1919, when thousands of revolutionaries in Berlin occupied buildings in an attempt to begin an insurrection but were quickly isolated and destroyed in a planned counter-attack. In January 1919, I attended a KPD meeting where Rosa Luxemburg and Karl Liebknecht were speaking. I gathered the impression that they were the intellectual leaders of the revolution, and I decided to have them killed. Following my orders, they were captured. One has to decide to break the rule of law… This decision to have them both killed did not come easy to me… I do maintain that this decision is morally and theologically legitimate. Luxemburg was shot in the head and tossed into the canal in the Tiergarten. A monument with her name stands at the point today. Infamous, that 15,000 Russian officers should have let themselves be slaughtered by the Revolution without raising a hand in self-defence! Why didn’t they act like the Germans, who killed Rosa Luxemburg in such a way that not even a smell of her has remained? But somewhat more than a smell of her has remained. Thousands march every year to commemorate the deaths of Luxemburg and Liebknecht. More than that, Luxemburg’s ideas will continue to speak to us for as long as the battle between the exploiters and the exploited continues. “Order prevails in Berlin!” So proclaims the bourgeois press triumphantly, so proclaim Ebert and Noske, and the officers of the “victorious troops,” who are being cheered by the petty-bourgeois mob in Berlin waving handkerchiefs and shouting “Hurrah!” Those who were routed in Flanders and the Argonne have restored their reputation with a brilliant victory—over 300 “Spartacists” in the Vorwärts building. “Order prevails in Warsaw!” “Order prevails in Paris!” “Order prevails in Berlin!” Every half-century that is what the bulletins from the guardians of “order” proclaim from one centre of the world-historic struggle to the next. And the jubilant “victors” fail to notice that any “order” that needs to be regularly maintained through bloody slaughter heads inexorably toward its historic destiny; its own demise. What was this recent “Spartacus week” in Berlin? What has it brought? What does it teach us? Was the ultimate victory of the revolutionary proletariat to be expected in this conflict? Certainly not. The weak link in the revolutionary cause is the political immaturity of the masses of soldiers, who still allow their officers to misuse them, against the people, for counterrevolutionary ends. The countryside, from which a large percentage of rank-and-file soldiers come, has hardly been touched by the revolution. So far, Berlin has remained virtually isolated from the rest of the country. The revolutionary centres in the provinces have been heart and soul behind the Berlin workers, it is true. But for the time being they still do not march forward in lockstep with one another, there is still no unity of action… Furthermore, the economic struggle, the actual volcanic font that feeds the revolution, is only in its initial stage. And that is the underlying reason why the revolutionary class struggle is in its infancy. Does that mean that the past week’s struggle was an “error”? The answer is yes if we were talking about a premeditated “raid” or “putsch.” But what triggered this week of combat? As in all previous cases, such as December 6 and December 24, it was a brutal provocation by the government. The revolution’s enemies can also take the initiative… Faced with the brazen provocation by Ebert-Scheidemann, the revolutionary workers were forced to take up arms. Indeed, the honour of the revolution depended upon repelling the attack immediately, with full force in order to prevent the counter-revolution from being encouraged to press forward, and lest the revolutionary ranks of the proletariat and the moral credit of the German revolution in the International be shaken. What does the entire history of socialism and of all modern revolutions show us? The first spark of class struggle in Europe, the revolt of the silk weavers in Lyon in 1831, ended with a heavy defeat; the Chartist movement in Britain ended in defeat; the uprising of the Parisian proletariat in the June days of 1848 ended with a crushing defeat; and the Paris commune ended with a terrible defeat. The whole road of socialism—so far as revolutionary struggles are concerned—is paved with nothing but thunderous defeats. Yet, at the same time, history marches inexorably, step by step, toward final victory! Where would we be today without those “defeats,” from which we draw historical experience, understanding, power and idealism?